Our friend Hugo got the OQO 02 and of course he is sharing his first impressions in this video. The OQO 02 uses a VIA Processor running at 1.5 GHz, that will make it perform probably a little better than a Q1 using a Celeron processor. Unfortunately I do not have any data to compare this device with the Intel Video Chip, keep in mind that the main problem VIA processors have is the video chip which performed very bad in our tests using the v7110. 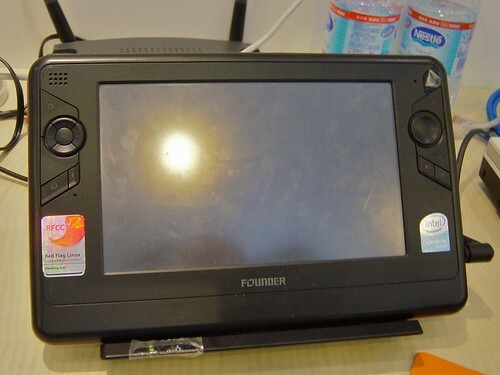 One thing that I would like to see is the Vista Performance table for this device but I do not know yet if Hugo's device came with Vista or XP. Steve at UMPCPortal posted today a video about his latest acquisition. Q1p with XP installed. Hey Steve, we have done the hard work already, installing Vista is a piece of Cake! and I really believe you should install it. As a valued partner and trusted advisor to our customers, I wanted to re-iterate Microsoft’s commitment to helping protect consumers and software resellers from the risks associated with pirated software. Millions of PCs that ship each year end up with non-genuine Windows® software, which puts you at a competitive disadvantage, and your customers at risk of a sub-optimal experience. The significant anti-piracy technologies built into Windows Vista™ software are designed to make the widespread pirating of Windows Vista more difficult. Now, all customers who deploy Windows Vista must successfully activate their product using a genuine product key. If a non-genuine product key is used in activation, customers will experience reduced functionality and lose certain features, such as Microsoft Aero and ReadyBoost. 1. Activation: In the first 30 days of use, all new installations of Windows Vista must be activated by the OEM, through Windows Vista volume licensing technologies, or by the end customer. If Windows Vista is not activated in the first 30 days, the system will operate in a reduced functionality mode. 2. Validation: In order to protect users from being victimized by counterfeit software, and to protect Microsoft’s intellectual property, Windows Vista includes ongoing validation. Through validation, if non-genuine Windows Vista is detected (including non-genuine product keys, cracked or tampered code) the system enters a 30-day grace period. During this time Windows Aero and ReadyBoost features are disabled, and Windows Defender and Windows Update will have limited capabilities (optional updates will not be available through Windows Update, and Windows Defender will only remove critical and severe threats). In addition, during this grace period, a message will appear repeatedly, encouraging the user to take the steps necessary to activate with a genuine product key in order to regain the full value of Windows Vista and to prevent the system from going into a reduced functionality mode. 3. Reduced Functionality: After the repeated prompts above, and if Windows Vista is not activated in the 30-day grace period, the system will operate in a reduced functionality state until a genuine product key is used for activation. In this reduced state, the user will have access to their files and applications, and access to the Internet. However, the desktop will be simplified with only a browser (no Start Menu or Task Bar) and Windows Vista usage will be limited to one hour sessions, at which time the user is forced to log off. Additionally, users may boot the system in Safe Mode in order to access or back-up personal data and applications. I encourage you to communicate early with customers about the activation changes. For customers that experience reduced functionality, you can help them resolve this by providing them information about how to activate their Windows Vista properly or enable them to purchase a genuine copy. Learn more to help you discuss this with your customers. If you serve customers in multiple ways, you may receive a similar communication from the Microsoft OEM team about these new anti-piracy changes. Together, we are working to deliver a great Windows Vista experience for you and for our customers. Once again, JKK has prepared a short video of the HTC Shift from an Interview with Steve Ballmer. I just saw it in one of my banners. Amazon is selling this keyboard for just 85 dollars. The cheapest price I have seen. I wrote a review about this keyboard some time ago and I really recommend it to anyone looking for a BT Keyboard. Note: Oops, you are saving 57 dollars. But anyway... 85 dollars still the one of the lowest price I have seen. Chippy as gone Green. He has created a new page to demonstrate how to use the Sun to power our UMPCs and other electronic devices. I always have found this idea interesting up to the point that I have been using solar energy to power my landscape lights for the last 3 years. And recently I recommended to install Solar Security Lights like this one to a company and they bought few of them. Like Chippy I have been thinking about power my UMPC with Sun but I have to confess that I'm not traveling that much so I have not gone so far in this project. But what amaze me is how many things have in common good friends. Good luck in your new project Chippy: Solar UMPC. I have to confess with this all UMPC concept I do not see me buying any pc desk anytime soon. But... if I have to buy one I really will consider one like this one in this AVING USA News. I really do not know what will be job effectiveness after lunch with these chairs, it seems to me that employees using them will fall sleep very easily. Don't you think? UMPCPortal has published the 2007 UMPC Buyers Guide. Bravo Chippy! Since the launch of 'Origami' in March 2006, there have been many varying reports about what an Ultra Mobile PC is and why someone might buy one. This guide has been written to help those looking at ultra-mobile PC's with a view to buying one. Its a long report but we guess that if you're considering spending over $500 on a UMPC, you'll want to read and learn as much as you can. I prepared a pdf file of this guide because I'm sure than more than one will like to have it saved to read it at anytime. The PDF file can be downloaded here. Recently I read somebody complaining about the fan noise in a Q1. Let me start by saying that my Q1 fan works quieter than the fan on my eo v7110 and a lot quieter than the one in my Compact notebook. To be honest I can't even notice the noise of the Q1 fan, but some people are ready picky with that. Well there is a solution. 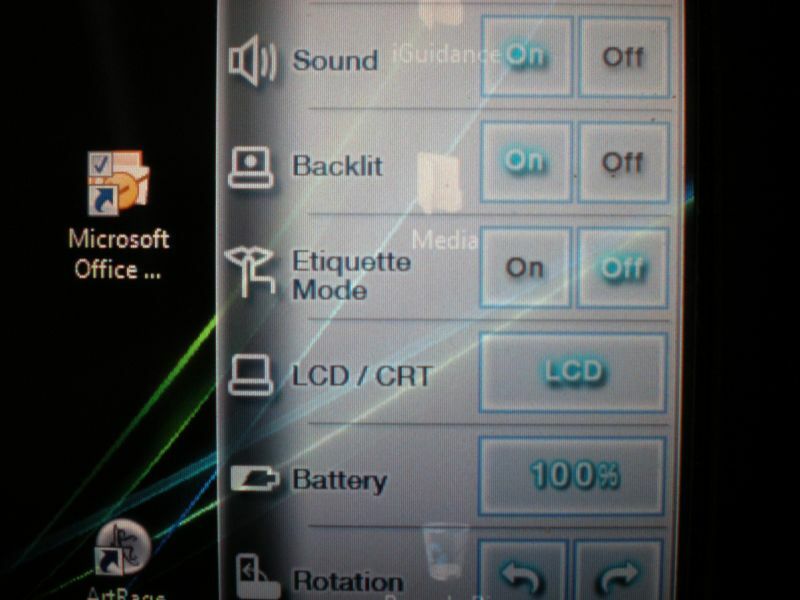 Samsung has added an option in the MenuUI called "Etiquette Mode". This option decrease the fan speed in half and that reduce the noise almost to nothing. Of course, expect your Q1 to work warmer. Windows Beta Team posted an interesting article about what are your options when your Beta RC2 Expire (May 18). And I said interesting because I did not know for example, that you can buy any of the Vista Upgrade Package and Install it on top of this Beta. That will save you an average of 50 dollars. Probably is not been painted in a Tablet PC but still something just incredible to watch. I just linked a few more here at todoUMPC. Here is a short demonstration of the Fujitsu UMPC thanks to JKK. That's basically what Gadget Lab is telling about the Konjisha UMPC. Rob Beschizza hates UMPC, but he likes this one because it has keyboard, I guess. Probably somebody has told these news writers that it's smart to trash UMPCs. Anyway... the bottom line is that this UMPC that I never liked because it did not have touch screen to begin with, now will come with touch screen. That's a good news. I should say also that this is the first UMPC using a AMD processor. We have been talking about it since Yesterday at todoUMPC. But I never thought that it could be of interest for our English Readers, and I was wrong because the news is in all pages relative to UMPC and Tablet PCs. Very good review, the lady says that the Q1 Ultra was using a Intel Celeron M, and it´s not clear yet if it´s an error or that unit really was using a Celeron processor. Another wonderful article written by Lora at What's new. I'm one of the lucky ones that is in her Messenger list and I can confirm than in more than one occasion she has given me very good advices using this communication tool. I see sometime other people installing Aol messenger and other instant messengers but I prefer MSN Messenger. The main reason is because it's there, preinstalled in Windows. And believe me, I have used it as one of my Remote Tech Support tools many times. People usually do no like to install new programs in their PCs so to me it's easier to ask them to use what they already have installed. Lora at What's New has published a wonderful article about her experience using Media Center to record TV movies in her UMPC. Want it or not, UMPC has marked our life for ever. Now that HTC has decided to go with Intel instead of using a VIA processor, the HTC Shift is one of the new UMPC to be seriously considered by anyone looking for a good UMPC. One of the readers of todoUMPC.com found something very interesting today: how quick Founder and Asus change Flags. The following picture shows how both companies placed the Linux sticker on top of Microsoft Sticker without even remove them. Socket Mobile has just released the CompactFlash Scan Card (CFSC) Series 5. Something that could be very useful for some Q1 Owners. VIA has released a few days ago a new driver for the VN800 chipset, the same one used in eo V7110 devices also known as Amtek T700, aka Ago 7, aka ... well, you got the point. As it's usual in VIA, none information has been posted about what this update fixes or what has been added new. One of the best news I have read today was coming from UMPCPortal where Steve is showing some of the UMPC prototypes shown in IDF: Fujitsu is entering the UMPC market. 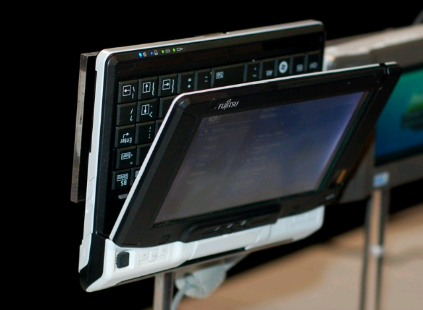 We all know the good quality of Fujitsu Small Tablet PCs like the P1610 and my only wish on this UMPC is for a Indoor/Outdoor display. I can't sleep well at night since I saw the P1610 display. i7210 owners can install the eGalax driver released here. Unchecking the box in the Power Tab of the driver fixes part of the problem with Stand By and Hibernation. This does not mean that with this driver all the problems that the i7210 has with Vista are going to end according to tests done by JKK but at least we now know that none of the problems come from this driver. In another words, we have taken one more variable out of the equation. Another tip shared by JKK is to install Synaptic latest Vista Driver. Many of you have asked me what's known about Vista Drivers for the i7210 and i7209 devices. So far I have found two very contradictory answers. The first one came from Founder (Chinese makers of these UMPCs) saying that these devices were designed to be used with XP and that they do not have any plans about releasing Vista Drivers for these devices. The second answer was sent by email to a friend of my by TabletKiosk saying that they are expecting to release these drivers in the next 4 to 6 weeks. The chances of Founder to release these drivers are the same than Tabletkiosk's. Both companies depend on others to design these drivers. Keep in mind that any UMPC is composed by parts made by other companies. To get all of them to release these drivers in a short period of time is not an easy task. So lets hope for the best. Yesterday somebody asked me how to sign a PDF in our UMPCs. Of course, I could start mentioning few tools that allow you to do that, but what about doing that for free? If you want to do that for free you will need a "PDF printer" type of program and Journal, which comes installed with Vista. There are many programs out there that allow you to print into a PDF file, but I'll recommend PrimoPDF and the reason why is because it's full compatible with Vista, and of course, a freeware. So, how we can sign our PDF for free? Simple, print your PDF to a Journal File, sign it there, in Journal, and then pint it back from Journal to a PDF file using the PrimoPDF printer. Probably is not the best option according to one of the latest review I read at Student Tablet PC. But I think that if somebody owns a tablet pc and start using a UMPC this person needs to understand that he or she is using a device with some specifications that are completely different than what that person had before in his or her Tablet PC. For example, a Small screen and on top of that, a touch screen. This is why I consider this review posted recently in Origami Project a very good example that shows that a Q1 is (if you know how to use it properly and you are willing to learn and overcome its limitations) a powerful tool in the hands of any student. First off, let me say that I do not put much stock in many of the Q1 reviews out there. It made me nervous to see all the negative reviews when I first bought my Q1. I was waiting for it to arrive and I kept seeing many of the negative reviews in major PC magazines, and it honestly made me wonder of I had made the right choice. I did, however, notice that many reviews from individual users were very positive. After using the Q1 for a few weeks I can see why users like it so much. Last week I went to Lean Six Sigma (LSS) certification training, to finish my certification requirements. Lean Six Sigma is the adoption of two business theorys that center on 1. reduction of waste and 2. reduction of variation (mistakes) in a process. It is a pretty intense training course and the classes have many requirements that make a computer a very handy device to have. Since the course was off-site, and there were several large books that were needed for the class, the UMPC is a perfect choice for this training. in LSS training one must take copious notes. There is a great deal of formulaic data that is used in the LSS business philosophy, so having detailed notes is a must to pass the course. I had purchased the Q1 organizer and keyboard from CDW before the course and I am glad I did. I can certainly type faster than I can handwrite and the decent sized Q1 keyboard was very useful. I worried that the pointing stick, nestled between the G,H, and B keys, would get in the way from time to time (I have had this problem with laptops in the past) but I never even felt the thing while I was typing. I have noticed that many compact keyboards are a challenge to type on when you are not looking at the board itself, but I found this keyboard did very well and I had no problem typing while watching the presentation slides go by. If I had needed, I could have used the touchscreen to take notes. As a test I did take notes on Windows Journal during one of the last sessions and found it quite easy to do. I will admit that it takes some getting used to as most of us are used to the physical feedback from putting pen to paper. The touch screen is so smooth that it doesn't feel the same at all. But one quickly finds that this only makes writing faster, and once you are used to using the touchscreen, it is a breeze. During the course, we also have to do many calculations. I found that OpenOffice Calculator was a perfecct spreadsheet program for these calculations. Many people in the class simply used a calculator, but I was much faster since I could simply put the formula in a cell then just type in the parameters in the appropriate cells. This saves a ton of time that most used up when they had to redo the entire calculation on their handlheld calculators. We had several graphs and charts that we needed to make during the class and the touchscreen capability was perfect for this task. A few people had laptops in class, and they used them to set up their charts, but I noticed it took much longer to do compared to the touchscreen. One of the things that is a requirement for passing the class is a presentation to demonstrate our understanding of key LSS concepts. I was able to put my presentation together during the class instead of waiting to do it on my time each evening. When it came time to conduct my presentation I was able to simply unplug the Q1 keyboard and take the Q1 itself up to the front to plug into the projector. Most who had to do presentations found it necessary to load it on a USB drive so that they could load it onto the instructors PC. The touchscreen was great for writing out the formulas, circling important points and demonstrating the concepts I was trying to present. It seems that the Q1 ended up getting more attention than the presentation, but I was more than happy to show off my new "toy." Many of the negative Samsung Q1 reviews seem to result from reviewers who try to compare it to a full blown desktop or laptop PC. 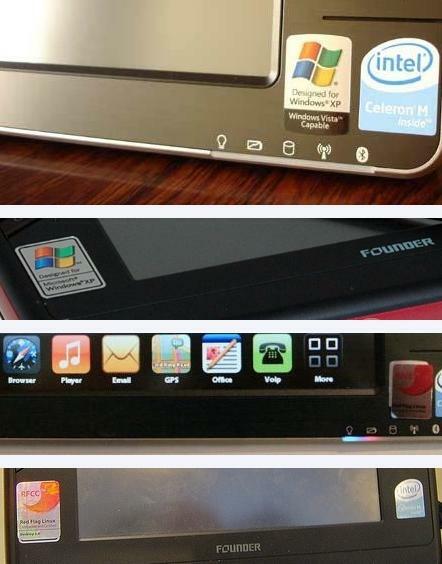 On the other end of the spectrum, there are those who want to compare it to a Pocket PC. Sure, in either of these comparisons the Q1 is going to loose. It does not have the latest super mega-monster processor, so it may not run 15 major tasks as well as the latest laptop design that hit the market. It is a bit large for pocket carry, so it looks too big in comparison to my iPAQ hx2795. What the reviewers fail to notices is that the UMPC sits nestled right between these two types of devices. It occupies its own niche, therefor it deserves to be reviewed and compared in that niche. If I were to write a review on my CBR600F4i and compare its cargo carry options to a Ford pickup, it would not do well. If I compared its fuel efficiency to my Cannondale bicycle it wold also do poorly. But for what it is, it is a great motorcycle. The Q1 is like that, it does well within its own category. Since buying the Q1 I have added a CD-rw drive by LaCie. I know many have complained about the lack of CD drive on the Q1, but that addition would defeat part of the mobility purpose of such a device. Sure, there are all kinds of extras I could add to a UMPC to give it more usable features, but then I might not be able to carry it in a coat pocket like I can with the Q1. Since buying the Q1 I have become a total UMPC fanatic. I am interested in the OQO model 02 and the new Q1 Ultra, and would love to have either one. However, I cannot say that I am disappointed in the Samsung Q1's performance. If you have a need for mobility and you are looking for a decent device to use for business, I highly recommend the Samsung Q1. Microsoft HID driver is causing the i7210 issue when the unit is coming back from hibernation or standby. A test using an earlier version of a beta eGalax Driver revealed that if we disable the option in the power tab of that driver that allow the PC to turn of the touch screen to safe power the hibernation and standby issue disappear. Unfortunately that driver still does not enable full HID support. Many of you have installed the new eGalax HID Driver and want to turn off the "Touch Pointer", that little mouse that gets in the middle everytime you want to tap on something. 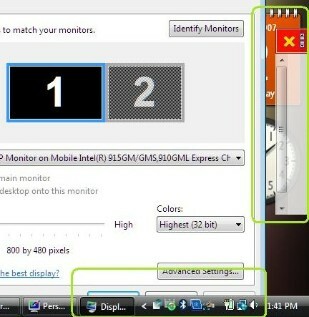 Here is how to disable it. 1. 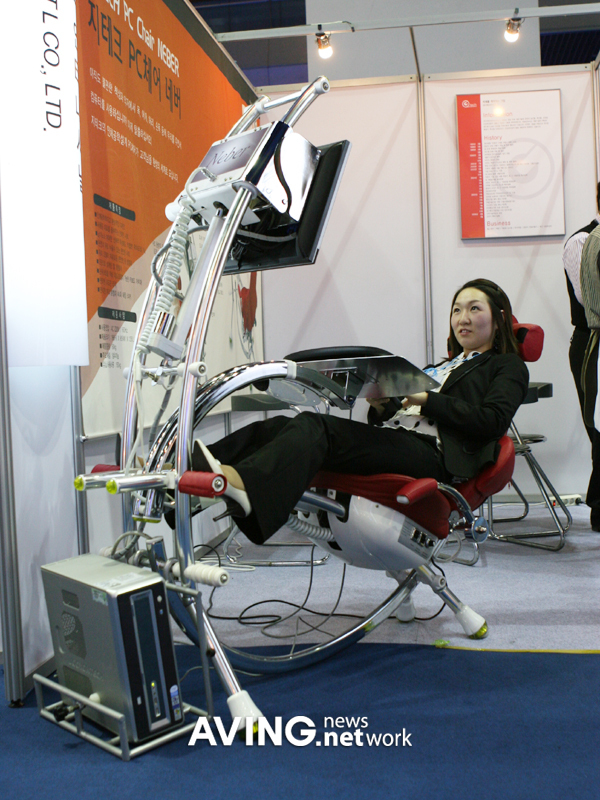 Open Pen and Input Devices by tapping the Start button , tapping Control Panel, tapping Mobile PC, and then tapping Pen and Input Devices. 2. Tap the Touch tab. 3. Under Touch Pointer, select or clear the Show the touch pointer when I’m interacting with items on the screen check box. 1. Use your finger to press and hold the taskbar. 2. Point to Toolbars, and then tap Touch Pointer. 3. To turn the touch pointer on or off, tap the Touch Pointer icon on the taskbar. Yeah! Now we will see/read Hugo at GottabeMobile.com! I could not understand Hugo's comment today at his blog! What a surprise! How close we are from having HID drivers for our updated Q1s? Well, I'm so pleased to say that we are very very close. As close that I'm writing right now in my Q1 and for the first time my handwriting looks real! Please, do not bombard me with any request. What I have is beta and I can't released yet. There is not any install yet neither a documentation of how to install what I have. But you can be sure that I'll push hard to have this released soon. ln fact, I have been promised a release this week. The PC Decrapfier, a friend has recommended me this program and I'll check it as soon as I have a few minutes free because if it does what it says it does, this is a must have in any UMPC. The PC Decrapifier is designed to remove a specific list unwanted software in an unattended fashion. Before running, the user may select exactly what software should be removed. Currently, it is targeted for use on most Dell machines; however it will theoretically run on anything that has the software listed below. You will need a USB keyboard attached to your Q1. Boot into AVS mode (make sure you have turned off from your last use of the Q1, nt hibernated). After the AVS logo screen you get a screen with the progress bar filling along the bottom. Whilst on this screen press F8 and you will be presented with two options, 1 is to continue and 2 is to delete stored settings. You should now have AVSNow back! I do not want to enter in more details because so far in these 3 last days the results have been bad. But in another hand the good news is that I have not gave up and somebody else with the power to really help has not gave up either! According to this report from Pocketeable.net, we probably will be able to order the Medion RIM 100 UMPC for around 643 dollars without GPS and $857 with GPS. This Medion UMPC uses a VIA processor so do not expect a huge performance here. But come on, for 643 dollars what else can you ask for! According to news posted today at UMPCPortal.com, the price of this device could reach the 1800 is 1200 Euros in Europe. If you ask me, that's too much money to pay for a device that is not that much better than the current Q1. In another hand, where is the Origami Concept? where is the low price? Note: Steve got a confirmation from Samsung and the price is around 1200 Euros. I do expect to see a price in USA of around 1200 to 1300 dollars instead of 1200x1.28= around 1500 dollars. I just read the news at JKK's blog and of course I tested and confirmed! Windows Movie Maker 2.6 Works beautifully in our UMPCs! 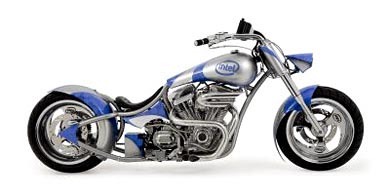 Intel has made a motorcycle that use a UMPC as dashboard and webcams as mirrors. Awesome, is not?! PowerFolder is a Secure, Peer-to-Peer File Transfer Tool. Easily share, backup, and access files over the Internet or in LAN. Did I say that it's a freeware? For more information on this tool and the download link check this page. We have been talking about UMPCScrollBar tool here. This tool is a must have in every UMPC using 800x480 resolution. It's my humble opinion that this program should have been part of Origami Experience pack. Even more, this tool should be installed by OEM in all UMPC using 800x480 resolution. To be honest, I never use the OE, to me is just a very good looking program and very well made but it does not have anything that I consider useful too me. I have learned to use other tools and optimize my desktop and Quick Launch to make my working experience better. But it's just me and that does not mean you have not done a good job on this second release. But... I really think that if there is anything that will make OE a must have is the inclusion of this little tool. Vikram Madan has released a fix for Vista UMPCScrollBar and a new version for XP. This tool is to me one of the most important tools that have been released since Origamis came to Market so if you have not downloaded yet go ahead and do it. This is one of those tutorials found on Youtube that is just awesome. Thanks to JKK I received today an invitation to test Joost and here are my first impressions. 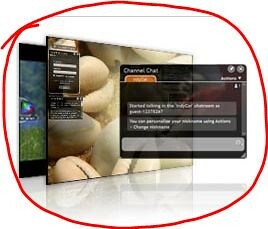 Joost is a TV service over the Internet. I found it to be a little heavy to be used in a UMPC but the overall performance is acceptable. At some moments the Video stopped and I could not find any indicator telling me what was going on. My guess is that the program was filling the buffer. The video quality was good. The image was sharp. I liked the design. I shot a video so you guys can see with your own eyes how it works. Do you remember this post? There I mentioned how Cleartype was a lot better when I selected the BGR option. Today I found why in this article. Thanks to a tip from Gotabemobile.com I found today what I consider the Eight Wonder of the UMPC World: The UMPCScrollbar! This utility runs in the background (no visible/configuration UI) and pops up an on-screen scrollbar whenever it detects a non-resizable dialog taller than the available vertical working screen estate. The scrollbar then allows you to nudge the dialog up and down, so you can access the dialog buttons that would otherwise be inaccessible. See the 'readme.txt' in the zip file for more information. Basically, and according to this interview of Josh Bancroft with Intel’s Chuck DeSylva, the 915 does not meet Microsoft Requirements to run Aero. I feel that I should remind you, my dear reader, that Windows Movie Maker version 2.0 was running on XP in our devices and now, suddenly, with Vista our same devices do not have enough resources. I really do not like when somebody takes decisions for me. It makes me feel stupid. Is not easier to give users the power to decide what's acceptable performance? I rencently posted here a review of iGuidance Navegation Software working in my Q1. Today I found this video review on youtube of how it works in an eo v7110. What can I say... iGuidance is the best software out there to be used in any UMPC. That's for sure. Hugo Ortega has posted today a very good article about HID Drivers. If you are patience enough to go to his blog without "killing him" this is something that you should read. And I'm saying this because Hugo is one of the lucky guys that have a Q1p upgraded to Vista with a HID support. But you know how things are between Microsoft and MVPs: a lot of NDAs. So at this moment He "can't reveal" how he got HID Support in his Q1p from Microsoft. And I'm make it bold because according to Origami Team they do not know how to do it, something that makes me think that probably it was the Tablet PC Team who helped Hugo to get this driver running in his Q1p. As you can see, it was easier for Sherlock Holmes to find the answer to the most complex of his cases than for me to find out from where exactly the HID support of Hugo's Q1p came from.